Despite the many violations of Armenian cultural and religious rights in Turkey, there are some Armenians in Istanbul who praise the Turkish regime and particularly its fascist President Recep Tayyip Erdogan. 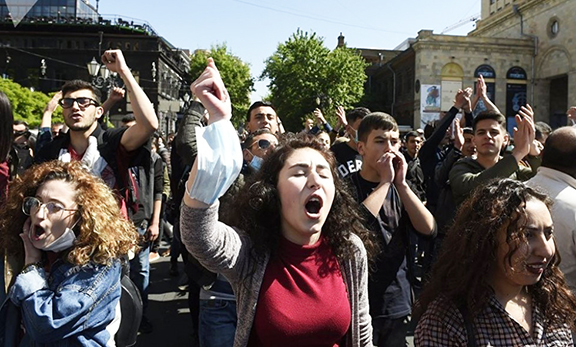 These few pro-Erdogan Armenians, who enjoy special privileges and access to high-ranking Turkish officials, represent themselves as protectors of the local Armenian community’s interests. But in reality, they have selfish motives. They either have personal business interests with corrupt Turkish leaders or seek to maintain their undeserved positions in Armenian community institutions. One such individual is Bedros Sirinoglu, Chairman of the Board of Sourp Prgich Armenian Hospital in Istanbul. In a recent interview with journalist Pinar Isik Ardor of Forum USA, a Turkish American newspaper, Sirinoglu made several false statements about the Armenian community in Turkey and distorted the facts of the Armenian Genocide. Furthermore, Sirinoglu told Forum USA: “Before Erdogan’s time, we could not even paint or repair our churches. We could only do it when the state pretended not to notice such actions.” Sirinoglu repeatedly claimed he has done good deeds for the Armenian community in Turkey. Several years ago, he said he had requested a meeting with Erdogan which was immediately granted. He asked Erdogan to permit the placement of a cross on the dome of the Holy Cross Armenian Church in Akhtamar. He reportedly told Erdogan: “Just as you cannot have a mosque without a minaret, similarly you cannot have a church without a cross.” Sirinoglu claimed that “Erdogan had the cross placed overnight on the Akhtamar church.” If Sirinoglu was so influential, why didn’t he ask Erdogan to restore the status of the Akhtamar as a Armenian church instead of designating it a “museum,” allowing religious services to be performed only once a year! Sirinoglu also ignored the fact that Armenians and others worldwide, including the Armenian Patriarch of Istanbul, had demanded the placement of the cross on the dome of the church. Sirinoglu was not the only one to make such a request. Back in 2010, Armenians in Istanbul launched a petition announcing that Sirinoglu is not their leader and does not represent the Armenian community. Angered by Sirinoglu’s statements, the petitioners stressed: “We live in a different Turkey,” not the Turkey described by Sirinoglu! This aghparik should be ignored. There is no point in trying to rehabilitate him through logic or reason. I agree, in every house there’s a bathroom. We’ve always been our worst enemy!! If we Armenians had fewer traitors, we were a powerful nation between the Mediterranean and Black sea! We should learn from our past sad history, and make a new prosperous Armenia! There are good and bad in every nation and we’re Not and cannot be the exception. If he’s an elected representative of the community then vote him out the next time. If he is not elected, just be patient, nobody lives forever. The genocidal policies of the so-called secular Turkish Republic have never stopped ever since it replaced the Turkish Islamic Caliphate in early1920s. Besides Armenians, other nationalities like the Kurds, Greeks, Assyrians, Syriacs, etc. also continue to suffer under Turkish Nationalists with fanatical Islamic tendencies. Although, it was the Armenians who paid the ultimate price and continue to do so until today. Nobody should judge the Armenians living in their ancestor’s lands under such harsh conditions. And, Turkish invaders will not rest until every non-Turk is eliminated, albeit slowly. Unless they can be stopped!